Get a Harley-Davidson bike insurance quote from Devitt today and we’ll compare prices from top UK insurers to find you our cheapest quote. Along with your bike policy you’ll receive a unique code that will entitle you to a 10% discount at SPORTSBIKESHOP! We’ve been providing motorbike insurance for UK bikers since 1936 so whether you’ve got a Softail Fat Boy or a Touring Road King Classic, you’re in expert and reliable hands when it comes to insuring your pride and joy. What can I expect to pay for my Harley-Davidson bike insurance? Harley-Davidson is one of the biggest American motorcycle manufacturers with a global recognition that all started in the early 1900s. William Harley created a small engine that was fitted to a regular pedal-bike. After that, a partnership grew with childhood friend Arthur Harley and the very first Harley-Davidson motorcycle was born. Harley-Davidson has continued to be at the forefront of motorcycle development – even launching its very first electric motorcycle: Project LiveWire! Surviving two world wars and the Great Depression, Harley-Davidson motorcycles grew stronger and more stylish with every passing year. Harley bikes were even supplied during the war for a means of transport. There’s so much choice when it comes to Harley, and many bikers love to customise their bike, too. Check out our quick guide to see which Harley would be best for you. Harley-Davidson undoubtedly manufactures some of the very best motorbikes in the world. With high-performance engines, sleek bodywork and some of the highest top speeds available, you need an insurance policy that you can rely on – which is where we can help. 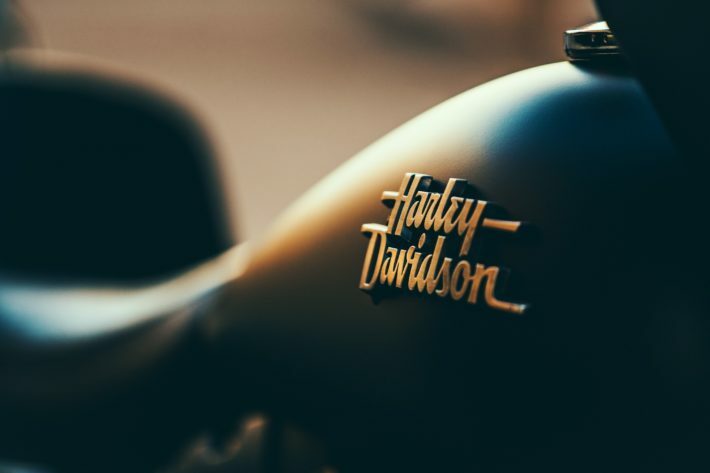 Harley-Davidson motorbikes can often be more expensive to insure than lower-performance models due to their high top speeds and potentially expensive repairs, although there are plenty of things you can do to reduce your premium. Buying through a motorbike insurance specialist means that you’ll get the advice and guidance you need so your premium stays as low as possible. Check out our bike reviews guide for riders’ opinions about their Harley-Davidson. Whether you’re looking for EU cover, excess protection – which could reduce your premium – Personal Accident cover (with optional leathers and helmet cover) or RAC breakdown cover, we can help. We’ll search through some of the UK’s top motorbike insurers to find the perfect deal for your Harley-Davidson. Here at Devitt, we’re experts in motorbike insurance and have been providing cover since 1936. Whatever level of cover you need – fully comprehensive insurance, third party or third party fire and theft – we can arrange it, along with friendly insurance advice and guidance on making a claim. Although Harley-Davidsons are a high-end motorbike and tend to carry a higher insurance premium, there are plenty of ways for you to reduce your costs – putting more money in your pocket for fuel and trips out on your bike. Using additional security measures can be one of the easiest ways to reduce your premium. Things like chains and locks to keep your Harley secure along with an alarm or immobiliser can all help to lower costs, as can keeping it locked away in your garage when not in use. A tracking device could help, too. Going on an advanced motorcycling course might also save you money, as it shows the insurer you’re a safe rider. The lower your mileage, the better, and you should also try to avoid adding performance-enhancing modifications where possible – your Harley is already a high-performance bike, so if you add any modifications it’ll only drive your premium up. Getting a quote for your bike couldn’t be easier. If you know the type of cover you’re after, you can grab a quote online. For more advice and guidance, you can call our friendly team of insurance advisors. They’ll guide you through the entire quote process from start to finish and will find you the best possible deal. Get a quote online or call 0345 872 3614. Follow the new Harley-Davidson series ‘Tracking’ which has been produced by Choppertown showing the story of the #HarleyHooligans racing team who are preparing for the Harley Hooligans Flat track series. Completed additional training? You could be entitled to 10% discount off you Harley-Davidson insurance with our partnership with THINK!